Charlie Sheen is “one-point-four” years sober now. Sheen recalled his wake-up call was not being sober enough to drive his daughter to an appointment. 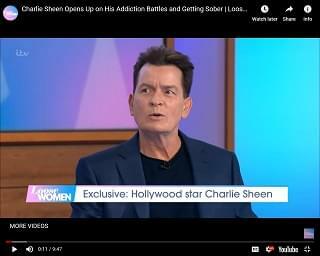 During his appearance on the United Kingdom’s “Loose Women” talk show over the weekend, he opened up further about his journey. Reflecting on his past, Sheen called it “surreal.” as if “there was some alien or demonic possession going on.” But he does note that he’s gone through his fair share of stressful times, especially during filming “Two and a Half Men.” “People forget that I went through two divorces and had four children, so that’s kind of a lot… but you’ve got to park the ‘rot’ before you go to work, because you’ve given them your word,” he added.